Currently, one of the strongest industrial growth markets is power generation. De-regulation of power and gas utilities in the United States and the increased demand for new power sources in emerging overseas markets has fueled this global expansion. At the core of this growth trend is the ever-increasing use of gas turbine driven generating systems to produce electric power. 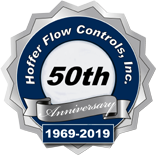 Hoffer Flow Controls has a long and successful history in a variety of measurement applications associated with these gas turbine systems. Our meters are used by every major manufacturer of gas turbines for applications that include fuel measurement (gas and liquid), wet NOx emission reduction spray systems, critical cooling water flow, fuel conditioning flows and condensate flows to name but a few. Our experience in international sales in power generation includes working with multi-national engineering and construction firms to supply flow meters for various applications for new gas turbine power plant projects in the United Kingdom, the Philippines, the Middle East region and Brazil. 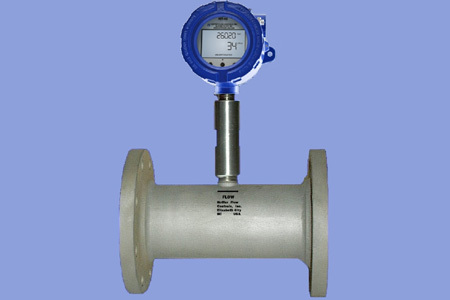 Included in these orders were Hoffer “Premier” natural gas turbine flow meters, similar to the one pictured above, in line sizes 6”, 8”, 10” and 12”. These meters were supplied for critical fiscal and mass-energy balance accounting purposes to precise specifications and tolerances. Hoffer meters were selected based on our unique ability to readily “tune” our meters to very precisely match flow rate and pressure drop requirements and to provide specific features and services required for each project at competitive prices. 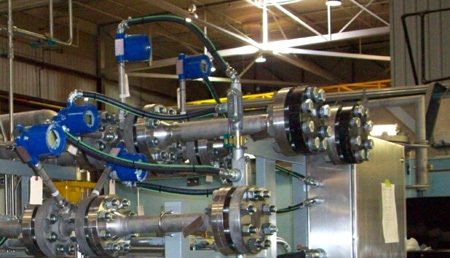 Special features and services provided by Hoffer for these projects included custom flow meter calibrations on high-pressure natural gas, complete flow metering skid fabrication, densitometer integration, custom protective coatings and customized electronics enclosures to meet local requirements. When you need flow meters for your power generation facility, think Hoffer Flow Controls first! We have the products, experience and know-how to provide you with the best solutions to your most challenging applications.